This, being the final lead of the Climbing-Knapsacking Section, was led honorably by myself to uphold the integrity of the local chapter schedule. My three currently loyal followers signed up, as I was not ordered to cancel or otherwise not conduct this activity. We left town, Friday night, to camp at an ORV park near Fremont Peak. This was the only public campground in the area. Getting up early, we navigated about, and found directions that led us to Hunter-Liggett Military Reservation. The entrance guard kindly gave us the directions to drive through the base, and go to the USFS road leading us to the trailhead. Soldiers marched about as we motored through. It was a pleasant sight to reach this segment of Los Padres National Forest. The hills were very green, and then rock formations appeared to our left as we closed on the parking. A sign gave us a clue where to park our vehicles, and I found the trail. A good show of wildflowers was taken from our primitive parking. Goldfields made a thick yellow carpet in front of large rocks. They are said to be some of the oldest rocks in the Coast Range, or some such trivia like that. We made our hiking start. The summit was some six miles and 4,000 feet above us. The trail took us through thick chaparral, and the switchbacks climbed at a steady rate. We gained views, then came to the pine forest near the top. Some residual snow lingered on the trail, which made some hikers' boots wet. Coming to the derelict summit lookout in about four or five hours, we ascended the stairs one at a time. There was a warning. I shot pictures (both photos) from the top. Part of the Pacific Ocean was visible. The most pristine scenery was to the north. 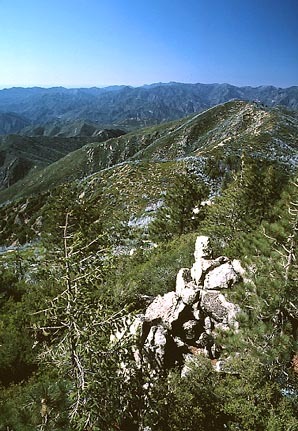 Most of the view northward included parts of the Ventana Wilderness. Some developed land was seen to the southeast. We quickly descended, seeing a horned toad (lizard), and arrived back at the vehicles. But, not before a final group shot of the three, who had completed ascents of so many peaks together with me, was snapped. The dusk light lit up a hill to the east. After dinner in King City, I led us to the west side entry to Pinnacles National Monument. I was tired. The people in the van behind me stated that I was weaving. We came to the NPS parking lot or campground, where I must have fallen asleep immediately. The next day, we parked at the large NPS lot, and took trails up to the High Peaks Trail to the east. Wildflowers abounded. The weather was perfect, and we enjoyed the hike uphill. Traversing this favorite hike of mine, we descended to a point, Chalone Creek, accessed from the east. I then took the talus caves route, the Balconies Trail, back to our west side entry parking. Flashlights are necessary in the caves. We had hiked about eight miles. On the drive home, we stopped at a big commercial fruit stand along Highway 152. I took pictures of the displays of produce, with soft evening light. I snapped a photo of an oak hill along CA 152. Then, we had a nice sunset. Thus, the activities of the Climbing-Knapsack Section came to a uneventful close. We had led and climbed 66 peaks, with hundreds of participants per peak attending, and summitting, accomplished. 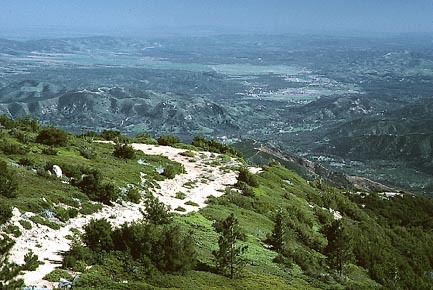 I had submitted, to the outings schedule editor, seven peak climbing outings for the 1987 summer, as a test on the ban. They were not printed. I was told that they were not to be submitted from me, further. Some outings officers later declared that there wasn't a ban, so I submitted several more trip write-ups, at different times. They were all rejected. Even winter trips, with skiing lessons provided, were not allowed. I waited, hoping for some common sense to prevail, but I left this chapter in the early 90's. I then joined the far more diverse, and active, Angeles Chapter. The Sierra Club does allow for changes in chapter affiliation, knowing full well that personality conflicts do happen. My few, following, years, after this ban, were spent in a state of depression, with no trips to lead. Then, all potential companions had to be contacted by phone. Luckily, other friendly persons organized trips. I visited many more wilderness areas and climbed many more peaks. My worst year came in 1989, when I climbed only 19 peaks, and was summarily retired from my job. The early 1990's saw the formation of the California Mountaineering Club, which I heartily partook in. I came to schedule a few more trips for them, and then the Angeles Chapter. But, that came to nought as attendance fell to almost no one. Their safety policy and my increasing weakness impaired the speed and expediency of the leads, so in the years after 2000, I had officially scheduled nothing. I began to tour, more, the National Parks, and other scenic areas of the West. While having peaks and dips in my yearly number of peak ascents, from 93 peak ascents in 1992, down to 29 in 1998, I did well enough. The local chapter outings had declined in quality to mediocre or poor, with mostly no one going anywhere. If you wanted plenty of exercise, with mountains to climb, it would be rather frustrating. My last, official, successful, lead, to date, was in mid-September, 1997, whence we six climbed Mt. Dana, Mt. Gibbs, and Tioga Peak in Yosemite National Park, under the auspices of the Sierra Peaks Section.